A portrat of Christopher Columbus. Photo Courtesy of Library of Congress, Prints & Photographs Division. Americans commemorate the arrival of Christopher Columbus in the New World on the second Monday in October. 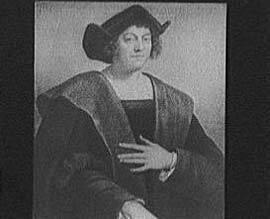 Although Columbus was Italian, it was Queen Isabella of Spain who funded his expeditions in hopes that he would claim new territory for Spain. In August 1492, Columbus left Spain and sailed directly west. He hoped to find an easy sea route to the India and Asia. Instead he arrived in the Caribbean Islands, including the Bahamas and the island of Hispaniola. Why do you think he called the people he found there “Indians?” Columbus Day officially became a federal holiday in 1971, but it has been celebrated for many years. It was first celebrated in 1792 with a huge parade in New York City. New York’s Italian population organized the event in order to honor the famous Italian navigator. The nation’s largest Columbus Day parade continues to be held in New York City. Throughout the country, Columbus Day is a day of school celebrations, store sales, picnics, and parades. There is controversy in the United States about Columbus and about celebrating Columbus Day. One state, Hawaii, now calls Columbus Day “Discoverers’ Day.” Why? Do you think this changes the meaning of the day?